Last week was an historic week for Coming to the Table (comingtothetable.org), an organization I’m involved with composed of descendants of slaveholders and enslaved. I spend a lot of time with historical records. Fifty, 100 years from now people will look back to see what our organization did. Most members will be long gone by then, but some people somewhere will look back to see where we stood. They’ll search archival records and Internet data that will be stored who knows how by then. They’ll look at pictures. And hopefully, among all the material they will find Coming to the Table’s petition http://petitions.moveon.org/sign/congress-pass-hr40-to-2/?source=search urging Congress to pass H.R. 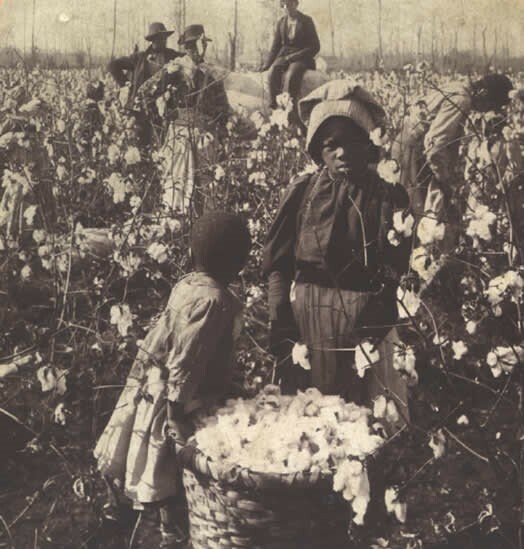 40 – Rep. John Conyers’ bill to study the issue of reparations for U.S. slavery. That document serves as a tangible symbol of our thoughts, feelings, and actions. I’d like to focus for a moment on the children. I’m in graduate school and lately I’ve been studying aspects of the Civil War. 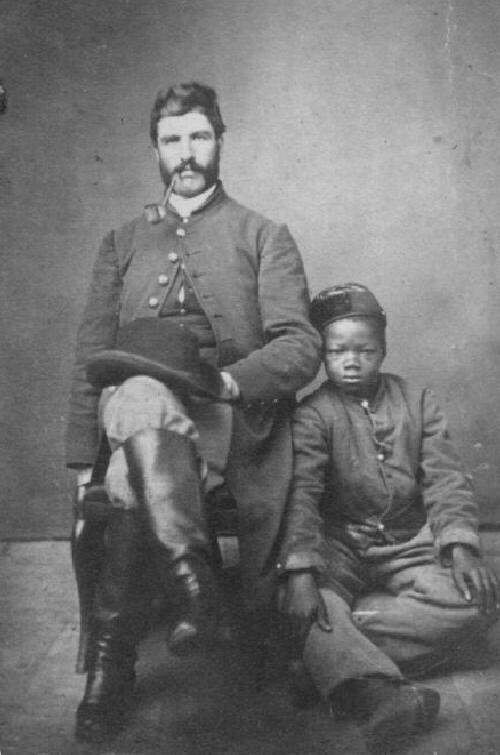 This is a remarkable picture of a Confederate officer with a young boy he owns. He took the boy to war. This boy could have been the only person this man owned, could have been one of dozens. We may never know the child’s name (though I am trying). What we can know is the magnitude of the crime committed against him as reflected in his very sad eyes. And let’s not forget about the people who loved him. What carnage did this child see? And the man… what word would you choose to describe his expression, his attitude towards the boy, his world view? I’m taking a digital images class this summer so I’m thinking a lot in pictures these days. Here we are in the sharecropping years. Look how little the littlest girl is. Maybe these girls are sisters, maybe not. Their basket is full – meaning their bodies are tired – and they may not be finished for the day yet. The youngest is looking back – maybe to her mama or grandma. What might she have been saying? And try reading the older girl’s face. It looks to me as if she is resisting or resenting the camera, not just squinting from the sun. Onto the Jim Crow era. 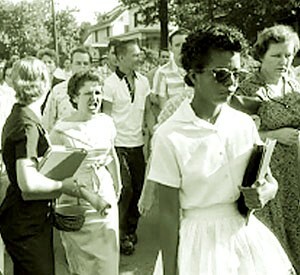 We’ve all seen this picture – Elizabeth Eckford desegregating Little Rock High School. I had the occasion to meet Ms. Eckford while on a southern civil rights tour. I was with a group of 50 high school students. The young people asked her if she would do it again. She almost shouted “Hell no!” Eckford told the students that every day she was body-slammed against lockers and spit on. Though she has gone on to do many great things in her life, Eckford said she’s never been the same since, mentally. Look at the woman behind her, the viciousness of her expression. Remember James Meredith and Ole Miss? What did this hostile treatment do to students’ sense of feeling safe in the world for years to come? And to poverty right here in the grand old U.S. of A. This mother’s pain is palpable. She might be thinking: Where is the next meal coming from? How am I going to pay these bills? I saw the same look on my own mother’s face when I was growing up. And finally, today’s school-to-prison-pipeline. How many young lives are going to be wasted by focusing on prosecution rather than prevention? Is this picture silly or what? It might be ridiculous but the fact is these things happen all the time. The criminal justice system is feeding off our children and people are making big bucks. Studying the ongoing impact of slavery, segregation and racialized policies towards African-Americans in this country is a small step, but it’s a needed one because it opens the widow to discussion. When we have that discussion, remember the children. Let the fresh air in. Check out CTTT member Dionne Ford Kurtti’s blog post on reparations at Finding Josephine at embed]http://dionneford.com/2014/06/motivational-monday-pass-bill-hr40-to-study-reparations. Wonderful article Pam. The photos added so much. Dear Felicia and Friends at CTTT — so glad to get your post on this. Though I’m still buried in completing our doc, Resurrecting Love, I’ve just started a blog myself and will figure out how I can link to you and send people news of Bittersweet as well. My friend who’s editing what I’ve written for my first blog (Ta-Nehisi Coates’s article in the Atlantic Monthly + a new source for examples of reconciliation experience from other countries.. ) already broke what I’d written into two posts. This may end up being a third post that happens tomorrow or the next day… I’m traveling and have meetings and events, so I’m limited on the road. Still I needed to reach out to congratulate all of you on your leadership and work here… ! I was delighted that Tom invited me to come and speak and show some of our film at the national conference ! but without airfare included, I couldn’t get to Kentucky from the Bay area… I look forward to finding out more about what happened there — tom said it was great. I have not figured out how to feel connected to CTTT and I can’t keep up with people’s daily posts. I’m telling you this because even though I haven’t found a meaningfully way to connect, I’m so aware of you, I tell others about CTTT’s work. I tried to get two folks who should be part of your linked by slavery network connected, but it will happen… so many people are coming together — at least in East Texas… it’s almost as though you can breathe it, if you dare. Felicia Furman, I would be so grateful to set up a time to speak with you directly… by phone — I’ll be back at home by this Sat. night…I’m in Oregon at the moment, and might be able to speak from here too, though reception been limited. Bay area better after Sat. p.m. Is this possible for you? You’re an experienced filmmaker I take it. I’m not and I’ve just lost my editor who does know documentaries. it’s all good, but I need to find a new editor and to learn from this process. I would be very grateful to speak with you as someone who’s been through what it takes to complete an hour long documentary. The wonderful post you commented on was actually written by Pam Smith. I was just the technology intermediary. Ill ask Pam if I may give you her email. Best of luck with the documentary. Thanks for getting back to me, Felicia. And thank you again for the support you already gave towards our documentary Resurrecting Love. Would you be open to speaking with me by phone about the documentary process? I would appreciate it a great deal. Of course. Give me your email and I’ll send you my telephone number. Or I am at ffurman@ecentral.com. Looking forward to talking with you. Your Shared History film and blog looks like a great model. Thank you for all the work you’ve done to help heal these wounds.